pdfToolbox Desktop 9 - Buy Now! We needed a solution that would increase the number of files we could optimize, allow extensive tweaking of the optimization process, return feedback on possible PDF issues, and offer better performance. We chose pdfToolbox! 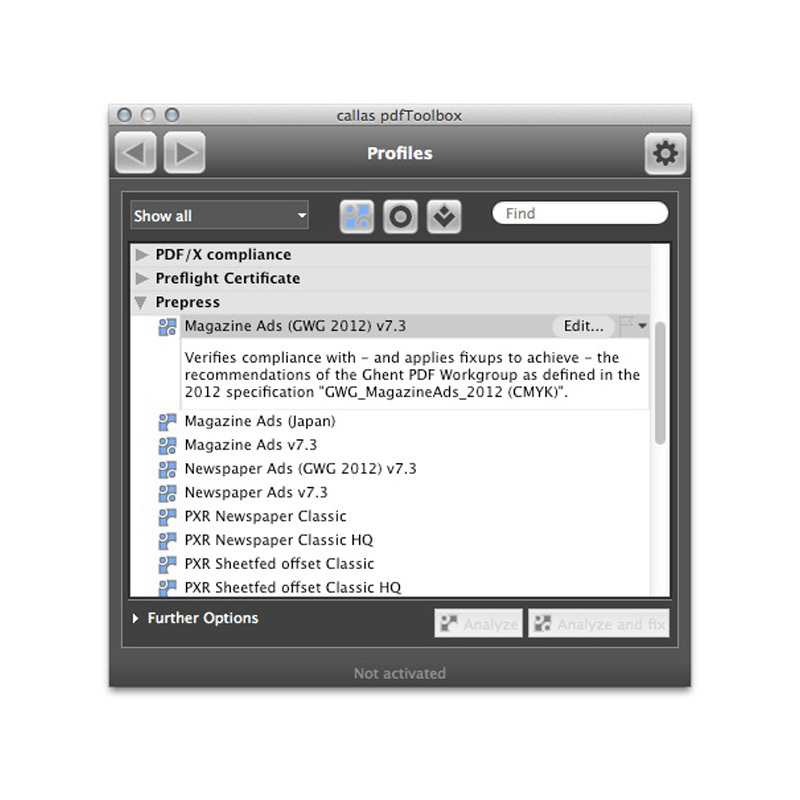 We decided to replace our own PDF checker with callas pdfToolbox as this is a more economical solution for us. It also provides us with new features, improved efficiency, updates and better technical support. 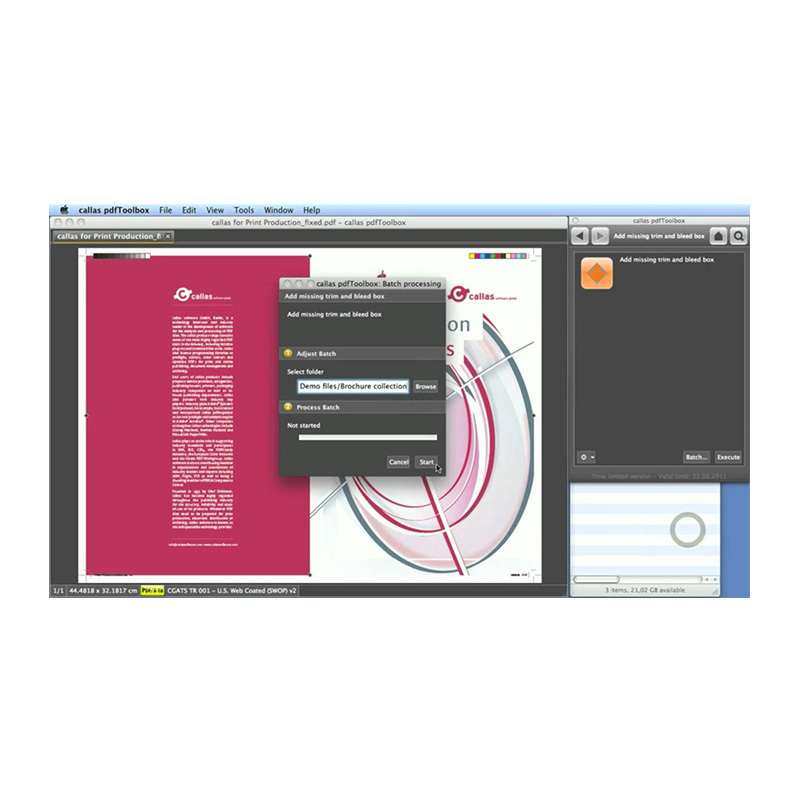 pdfToolbox makes it possible to convert any PDF document to a multi-channel color space using an appropriate ICC Profile. This means RGB or CMYK content can easily be converted into hexachrome, CMYK + Red or any other multi-channel scenario; this is of critical importance for packaging and – increasingly – all digital workflows. Also included is support for the creation of PDF/X-5n files, an ISO standard that is designed to support such color spaces in prepress data exchange. In many workflows barcodes need to be added to documents at some point in the workflow. To enable this pdfToolbox 8 now includes a full, professional barcode library that can add over a hundred different types of barcodes to PDF documents. 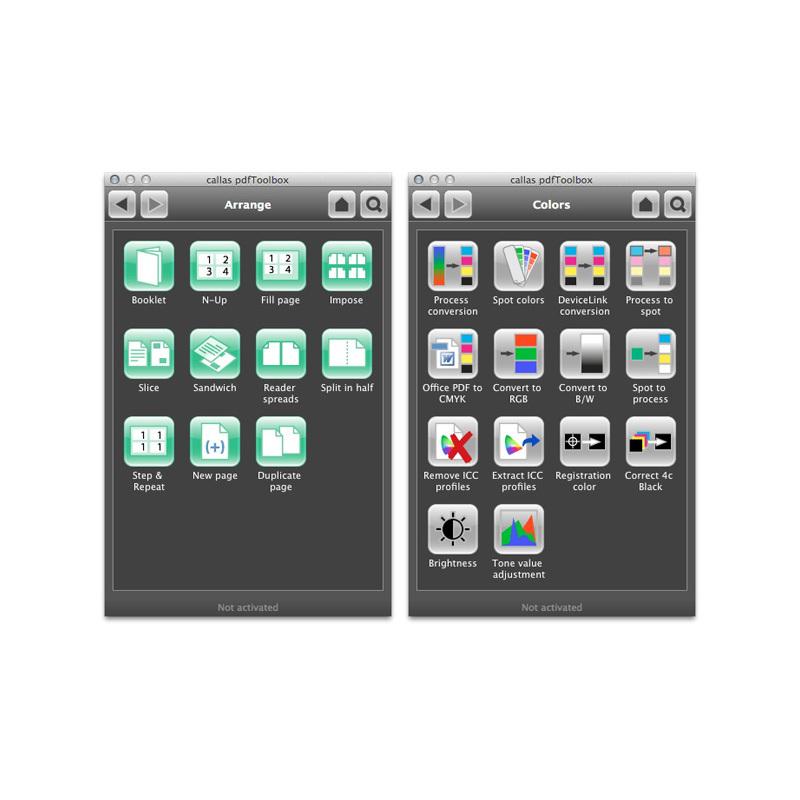 From 1D to 2D barcodes or QR codes, pdfToolbox 8 covers it all. Adding page numbers to a PDF document is a recurring request and with the new “Add dynamic text” fixup, pdfToolbox 8 makes this possible. The fixup allows adding a wealth of information, either static text or dynamic text on a PDF document using a number of different fonts, colors and placement options. Using preflight, pdfToolbox has always been capable of quickly detecting problems or potential problems. Using the visualizer many preflight problems (such as bleed errors or ink overruns) can quickly be diagnosed visually. The Object Inspector adds to that the ability to see a comprehensive list of properties for all objects in your PDF documents. Users can click on a document to see which objects are used in that location, and examine all properties (font, color, transparency, resolution…) of those objects. A great tool to pinpoint pesky problems detected by preflight or simply to pick apart a troublesome PDF document. Of course pdfToolbox also introduces a host of smaller updates to existing features. Two important ones are quicker processing of big PDF documents and support for TIFF export with result files of any dimension. 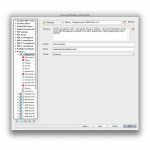 pdfToolbox checks and corrects documents according to industry standards, including PDF/X-1, PDF/X-3, PDF/X-4, PDF/A and PDF/VT, and can convert native documents created with Microsoft Word, PowerPoint, Excel, Publisher, Visio and Project, OpenOffice, Pages (Mac OS X only), PostScript and EPS, PNG, JPG and TIFF images into print or publish-ready PDFs. pdfToolbox uses the same robust PDF preflighting technology found in Adobe Acrobat, but allows you to automate and batch process PDF files. Installation could not be easier. The auto-running installer does all the work, including locating your copy of Acrobat, and dropping the manual on your desktop. Once installed, you’ll have a new menu option in Acrobat’s Plug-ins menu. The pdfToolbox has a very simple and clear user interface that will make it easy for you to become productive immediately. 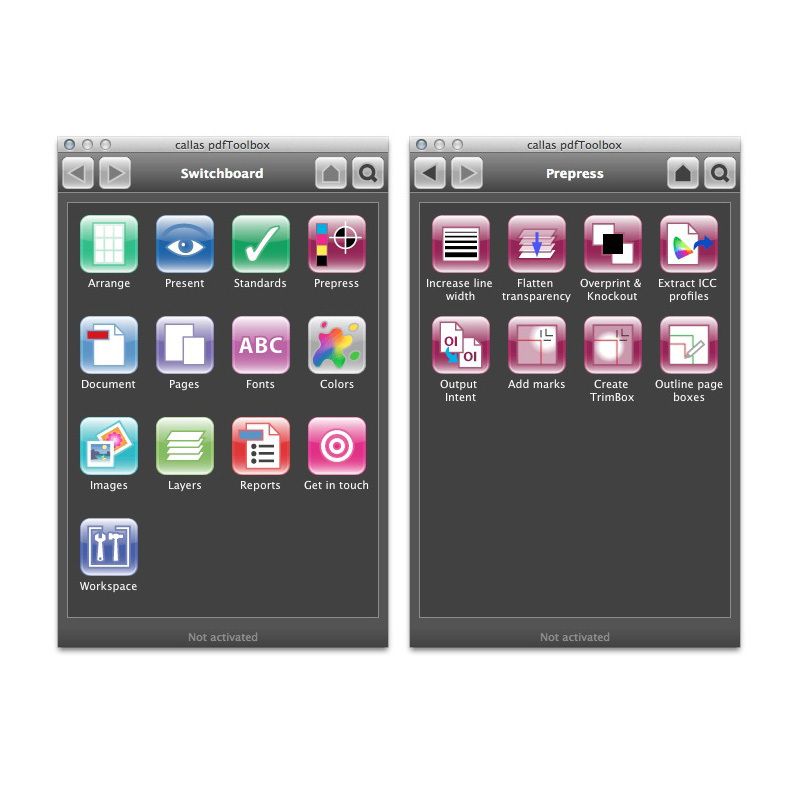 Launch this by choosing pdfToolbox from the Plug-ins menu. In the main view, known as the Switchboard, actions are grouped by functionality. You display the actions within a group by clicking the icon. When you select an action group, the display pane of the switchboard will change to provide you with the actions within that action group. At the top of the updated display you will also find a short description to help you understand the function of the action. A great deal of thought has gone into not just the intuitive interface, but also into the number of clicks that it takes you to actually invoke an action. This is one of the most streamlined interfaces you will ever come across. You can be confident that you will become productive immediately. 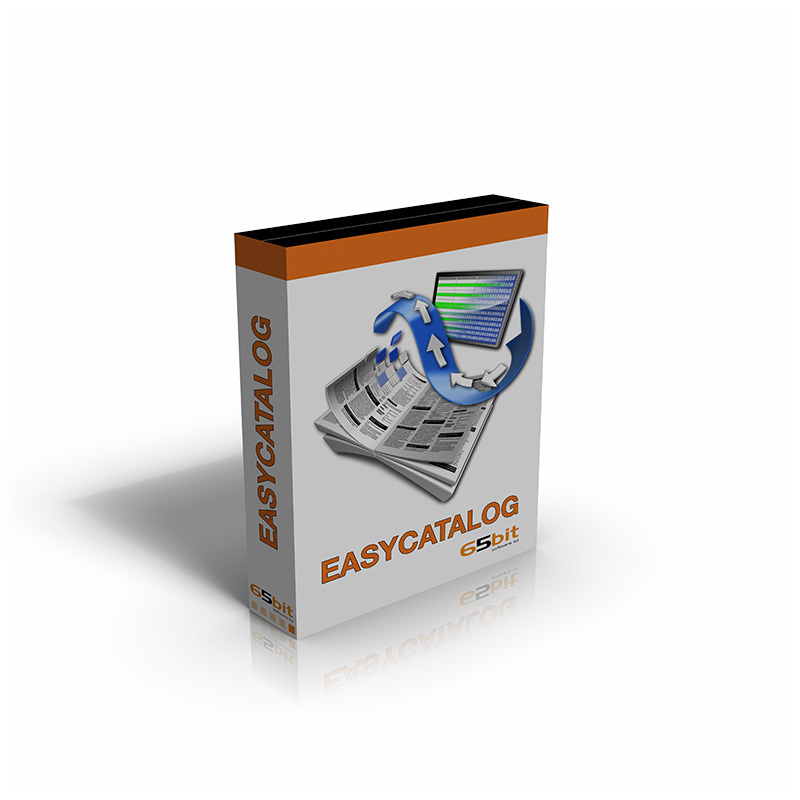 While the switchboard is extremely handy and provides you with quick access to actions, you can completely customize it to your specific needs thereby making it even more efficient and crucial to your workflow. 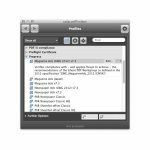 pdfToolbox enables you to create a myriad of fully imposed signatures, as many as eight pages up. For simple projects, click the booklet button to generate a quick two-up page perfect for your desktop laser printer. For larger output devices, and using a drop-down menu with pre-defined templates, choose from two-, four-, or eight-up signatures for saddle stitch or ganged jobs. Unlike some other impositioning products, pdfToolbox can also provide n-up. This is wonderful for getting the most out of your sheet and customizing an imposition layout. Just type the number of pages across by the number of pages down and pdfToolbox does the rest. Using reader’s spreads, print a job back to front, or split large spreads across two pages. Step and repeat enables you to gang the same page on a single sheet by the number of times you specify. OK, so not everything is intended for output to a press. You may optimize a PDF for use as a slide presentation, create handouts with n-up slides per page, and background borders, and create contact sheets of presentations. Using this group, you may send the PDF to InDesign or QuarkXPress. You may also create a new version of the document by replacing the chosen objects with the chosen objects of another document. If you are a member of the huge group that is using PDF to output, you’ll really appreciate the quick and easy fixes to common PDF-creation mistakes. Using these actions, increase line width, flatten transparency, adjust overprint and knockout behavior of black or white text and vector objects, save ICC profiles from the document to the desktop extracting either the output intent ICC profile or source profiles, and set/replace/remove an output intent that was embedded in the PDF by the creator. These actions are for changing the document’s properties. Easily and quickly optimize for printing, for black-and-white prints, or for posting and reading on the web or in an email. Optimizations reduces the file size appropriately for the intended use. Using these actions you may also clean up and remove unnecessary content from the PDF. 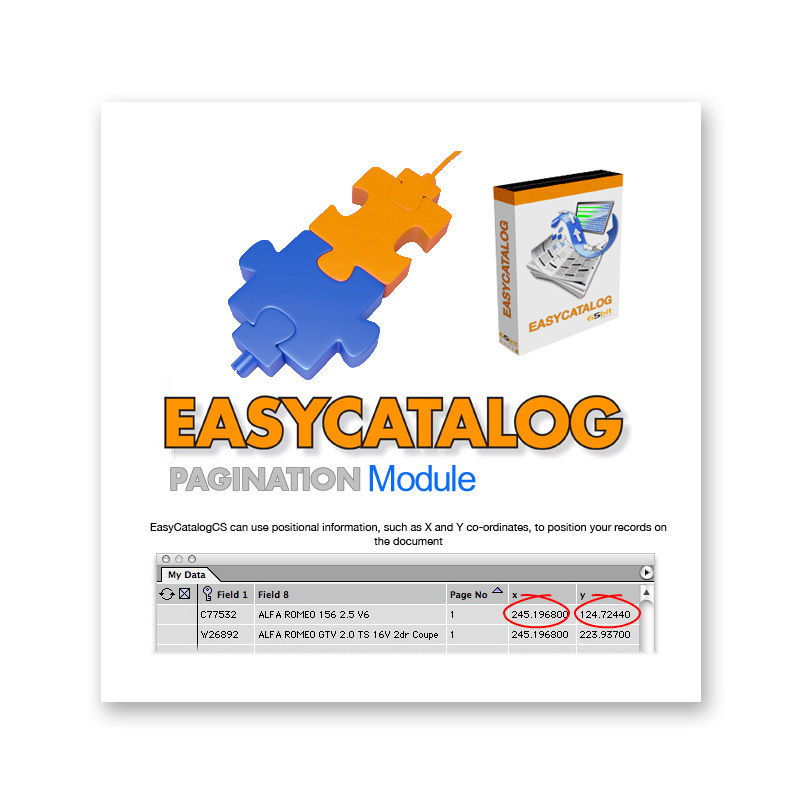 This action group provides you options for changing the page layout. You may scale the PDF proportionally to fit into the specified paper size, scale by a specified percentage, scale the page dimensions without changing the page content scale the page content to a given percentage without changing the page dimension. On the other end of the spectrum, you may enlarge the page area without modifying the page content. You may move, rotate, or flip the content of a page by a user-defined value. You may also crop a page to the visible area. 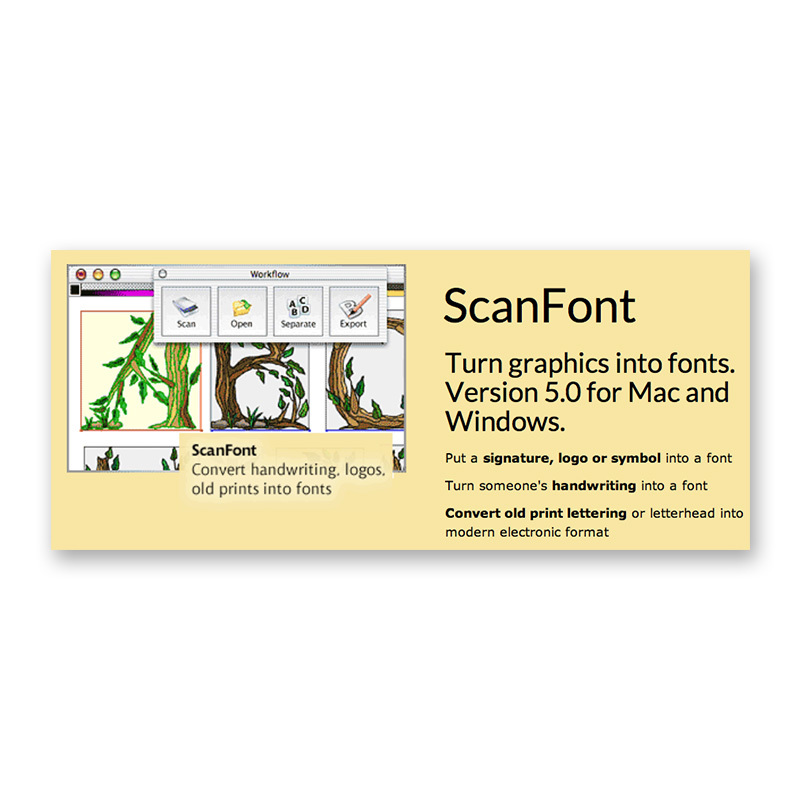 Fonts have always presented special challenges when working in a PDF workflow. With these actions, you can embed missing fonts in the PDF if they are installed on the system, create font subsets of fully embedded fonts to minimize the file size, replace an embedded font with another font, or even convert fonts to outline so that these fonts do not remain in the PDF. Next to fonts, colors are probably the next most common show-stopper, but with pdfToolbox (and without ever turning to the originating application) you can perform a process-color conversion, modify the name, alternate color, and overprint setting of spot color, and map spot colors to other spot colors or convert them to CMYK. With DeviceLink conversion, convert colors in the current PDF based on DeviceLink profiles. Each of these color adjustments can mean the difference between stopping production for an urgent phone call to the customer, or keeping the presses running. You may adjust tone values by a given percentage, convert Office-generated PDFs to the selected printing condition, convert to RGB (sRGB), convert to black and white, convert all spot colors to process colors, remove ICC source profiles from tagged CMYK color spaces, and save ICC profiles from the document to the desktop, extracting either the output intent ICC profile or source profile. You can even convert the registration color to another color. For correction, restore inadvertently separated black and black text and vector objects with values in all CMYK channels can be converted back to pure black. Lastly, adjust the brightness of all objects on the page, making them better suited for black-and-white pages or when you have converted a color PDF for output in black and white. Making better PDFs is the primary goal of pdfToolbox, but the developers would have been remiss to exclude graphics handling. Lucky for us, they didn’t. Using these actions you may reduce the resolution of images and recompresses images in a user-defined compression type. The reports actions provides you a quick yet detailed report of the content of a PDF. The new preflight report layout that is more visually useful and provides information in a clearer and more precise way. It is fully customizable so that users can add a company logo or brand colors when required. Now that we’ve covered some of the single actions, you can perform custom analysis and correction of PDFs using the power tools process, inspect, and adjust. Using these options, you may create your own checks and corrections in whatever combination fits your workflow. 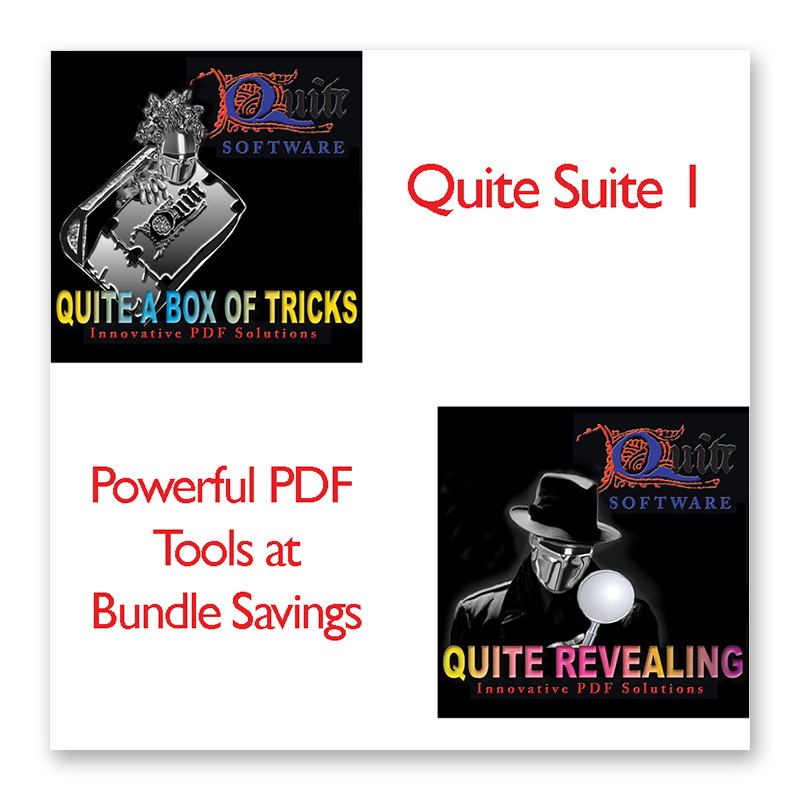 New generation PDF transparency flattening and font library where the software uses updated Adobe libraries for smoother results and better overall performance. The same engine can also flatten overprint throughout a PDF file avoiding overprint problems on RIPs that have issues in that regard. A new font engine handles inadequate or corrupt fonts and is much better at embedding and sub setting fonts and resolving broken fonts issues. The new preflight report layout that is more visually useful and provides information in a clearer and more precise way. It is fully customizable so that users can add a company logo or brand colors when required. 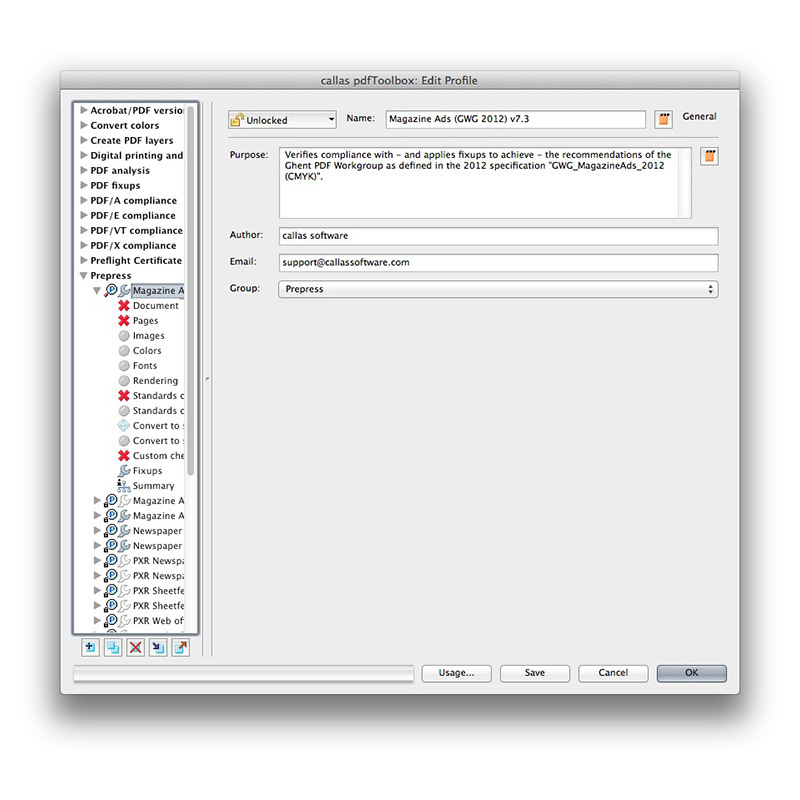 Removing metadata from PDF documents and advanced preflight checks including the ability to calculate, and report, the total area coverage for each separation in a file, the exact number of separations in a file and whether given separations are identical or different between two versions of a PDF file. callas pdfToolbox provides fully PDF compliant solutions from pdfToolbox Desktop, running on individual workstations to the fully customizable pdfToolbox Server solution that allows you to quickly output large amounts of PDF compliant files. Then you should take a look at callas pdfToolbox SDK. Want to integrate pdfToolbox Server on UNIX Systems? Then we have the right tools for you. Check out callas pdfToolbox CLI. At least 2 GB of free storage is recommended. Categories: Manufacturer, callas software, Software Category, Content & Graphic Design, Adobe Plug-ins & Extensions, Conversion Tools, Print, Prepress & Publishing, Imposition, PDF Tools & Utilities, Preflight & File Checking, Print, Workflow, Production & Automation, Preflight & Correction. Tags: Acrobat, Adobe, Callas, Correct, correction, DeviceLink, Impose, Imposed, Imposition, PDF, Plug-in, Plugin, preflight, Preflighting, Prepress, Print, Printer, Printing, Workflow.